RAWALPINDI (92 News) – General Dato’ Sri Zulkiple Bin Haji Kassim, Chief of Malaysian Army, called on Chief of Army Staff General Qamar Javed Bajwa at General Headquarters on Tuesday. During the meeting, views were exchanged on issues of mutual interest, including defence, training and security cooperation between both the countries and overall regional security situation. Later, the delegation was given a detailed briefing on operational and training activities of the Pakistan Army. General Dato’ Sri Zulkiple Bin Haji Kassim acknowledged and appreciated Pakistan’s efforts for elimination of terrorism. 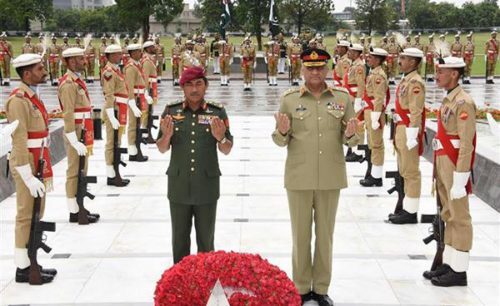 Earlier on arrival at GHQ, the Chief of Malaysian Army laid a floral wreath at Yadgar-e-Shuhada. A smartly turned out contingent of Pakistan Army presented the guard of honor to the visiting dignitary. 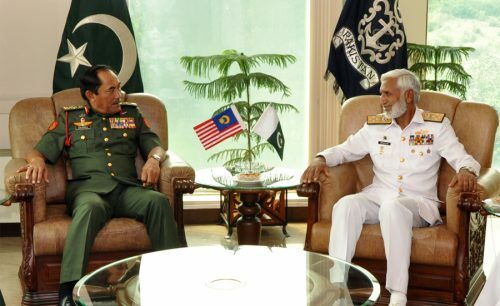 Later, Chief of Malaysian Army Gen Dato Sri Zulkiple Bin Hj Kassim visited Naval Headquarters and called on Chief of the Naval Staff Admiral Muhammad Zakaullah. During the meeting professional matters of mutual interest came under discussion.